Freelancers, consultants, small teams who need time tracking and invoicing or just want to improve their productivity. 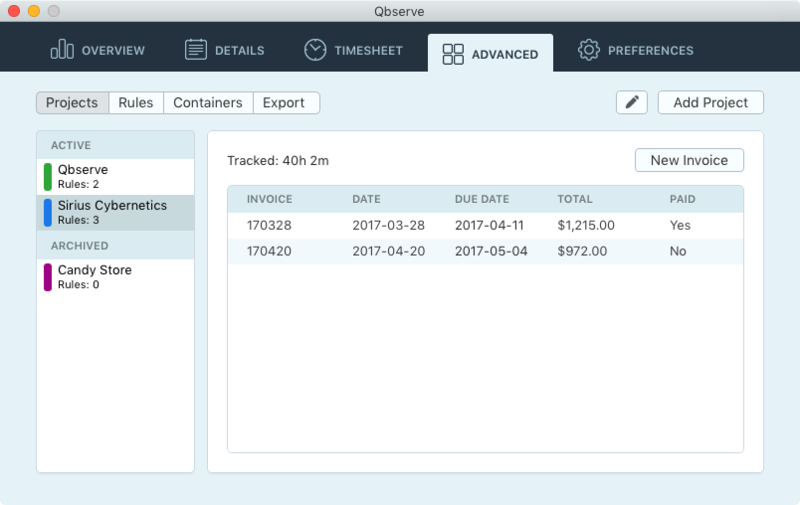 Qbserve provides everything you need for seamless time tracking of your work hours or freelance projects: automatic productivity tracking for websites and apps, automatic project tracking based on opened documents and web pages, invoice generation, real-time performance feedback and notifications, various reports and timesheets, scheduled data export, Slack team and Skype chat tracking. There is no subscription and all the tracked information is stored locally. Pros: I glance at my status bar, a percentage telling indicates how productive I've been today. 15%...not good. I click on the percentage, and an overview window pops up with 3 columns detailing the amount of time I've done productive, neutral, and distracting activities, each broken down by percentage of app use time. Looks like 14% ("39 minutes" when I hover) of the 3h29 of distracting time today was spent on Twitter. My productive time has mostly been spent working on a Google Doc (the app distinguishes websites when you use a browser). Also on this overview page, a pie chart breakdown which also lets me know I was 7% more productive than yesterday. Finally, spanning the bottom third is an absolute stacked chart broken down by hour, and I see that I was most productive in the 10am hour. At the very bottom, I can go back or forward a day, and pause time tracking for a few minutes. That's just the overview tab, and I'm already well aware of what my time has been spent on. 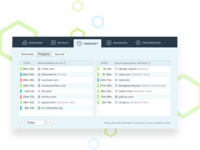 I can stop here or get more insights on a Details tab this is where I'll categorize "uncategorized activities" by type and productivity, of which there aren't that many because of the crowd-sourcing of categories. Lastly, the timesheet tab allows me to get a minute by minute breakdown of what I was doing at the time. With only three tabs in a window that takes about a quarter of my screen, I have complete understanding of the time I've spent today on my computer. It's infinitely valuable. Cons: The software can feel very slightly unwieldy when you first pick it up due to the amount of functionality and information at your fingertips. However, the developer has done a good job of hiding advanced functionality in a separate tab. 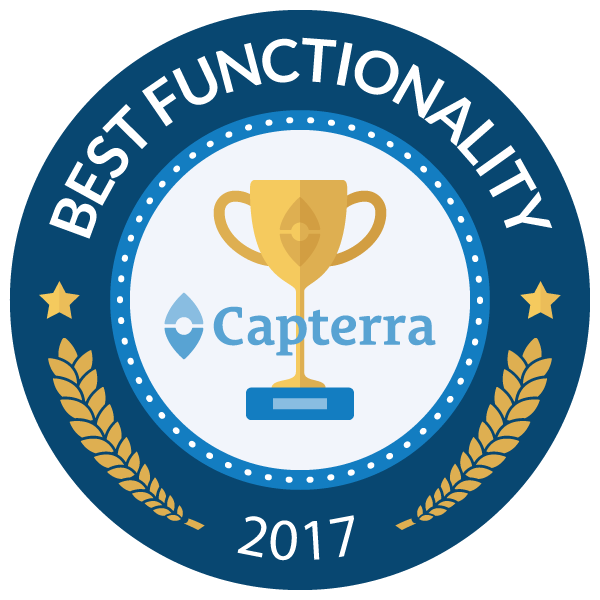 After a few weeks I felt very comfortable using it, and knowing where to look for the information most relevant to me at the time pertinent: percentages vs absolute values, stacked bar chart vs pie chart, hour-by-hour breakdown, etc. 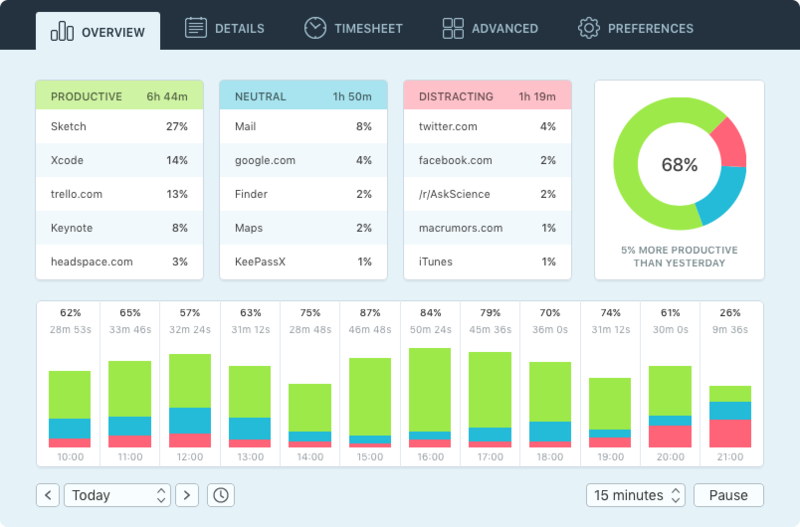 Overall: Great insights into how I spend my time on the computer (majority of my day). I learned when I was most productive and which bad habits to cut down on. Pros: Qbserve works. I often set goals like "today I want to get 6hrs of work done" and Qbserve's precise activity monitoring lets me be sure I'm staying on track. Qbserve makes it possible to accurately measure my productivity. The ability to detail which tools and websites I consider productive gives me high confidence that I'm hitting my goals. Qbserve is also very flexible. Sometimes my goals are "today is only for working and I want to be at 90% productivity regardless of how long I work" or "today I need to put 4hrs of work in but it doesn't matter if they're intersperse with breaks". I've come to depend on Qbserve. It is the first time tracking tool that actually works for me. Tomato timers, daily planners, dedicated "work only" areas -- none of these work for me. I used to constantly worry if I put in enough effort on a given day. With Qbserve I don't need to worry because I can trust its precise measurements and reminders. I'm a software engineer so often its hard for me to measure productivity on work items, and I used to constantly worry if I was getting enough done. Instead, I rely on putting enough hours in per day or week to measure my productivity. Cons: The name. It's hard to say out loud. "Que-b-serve"? It's hard to tell people about because I have to spell it out in order for them to google it correctly. It's like "observe but the O is a Q" is the best I can do but they don't remember. Single platform. I work across macOS, Linux, and Windows. I really really really wish I had a unified way of tracking time. Stitching together data from several tools is painful. And I have yet to find a tool that works as well as Qbserve. Overall: I've drastically increased my productivity while simultaneously removing any worry that I wasn't getting enough done. With Qbserve I have accurate measurements that keep me on track. Pros: I have used over 10 various tools to track my productivity and activities on my Mac. Everyone of them had some issues. Some tracked activity really badly, some had too much additional functions and etc. And then I have found Qbserve! I was amazed by the nice User Interface and aesthetic look and feel of the App. It looks like someone did really good job to find the most needed functions and made them in the highest quality. Once app starts, you don't need any more actions to make it work - it just starts tracking activity and gives labels for each task: "distracting", "neutral", "productive". It goes very accurately. This was just what I needed and I didn't found this function working good enough on other apps. Now I'm using it for 6 months and I have no problems with it. This App is one of the best I have ever had on my Mac from any category. 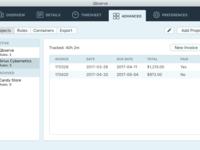 Overall: Qbserve brings me clarity on hours I have spend on my Mac. I see how many hours I have worked on design, web development and how many I was distracted. I found no other tools to see this good enough. It is very valuable for me, because now I know how many hours I'm productive in the day, how many distracted. I can see all previous days of the week and the month - it helps me to find reasons why I was not productive on some days or remember what made me very productive! So it brings a lot of value when I need a realistic estimate on time I will spend on the new project. It is very useful for me and for my clients, because I can calculate more accurately how much project will cost and how long it will take to make it. 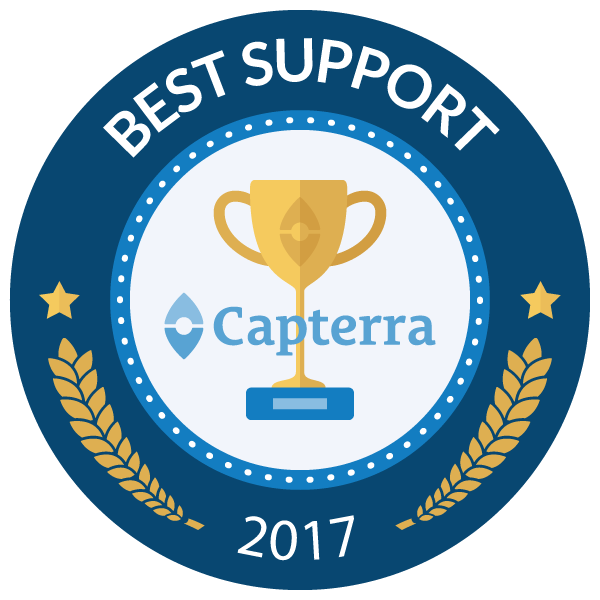 Great app, great developer, great support. Pros: Really polished app. Been using it for several months now, and with the latest version (1.62), it kind of does everything you'd need as a freelancer. Automatically adding activities to projects based on rules (like the title or the path of the open document), but also being able to manually add them is a bliss. I'd say being able to manually create an activity that wasn't tracked would be the only thing missing here (think of phone calls, for example). It also caters to the non-professionals, with simple to categorize activities, and a beautiful Dashboard, where you can see at a glance the productive & distracting times (also as percentages), and a per-hour/day/etc graph for the currently selected period. The great developer as well, open to feedback and suggestions! Cons: Features could be a little better organized. The user interface could be a bit more flattened (personal preference). 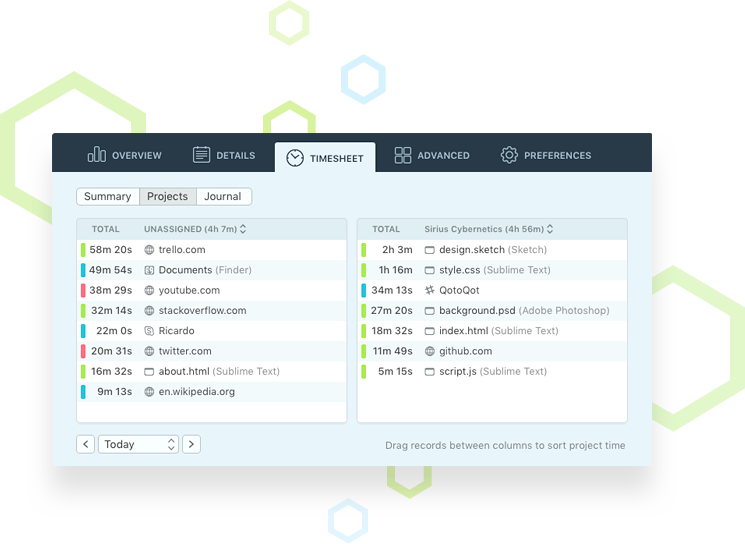 If you need your time tracked, this app should be on your Mac! Pros: I've tried almost any time tracking app you can find and Qbserve is the most consistent (meaning whatever apps you're using or websites you're visiting, it supports tracking it) and detailed of the bunch. It's also out of your way, chillin' up in the menu bar for whenever you need it. Don't need it? Don't click it. Then, when you do, click it! It'll be there, faithfully recording what you do on your Mac and standing ready to report that info to you quickly and in a format that works for you! Cons: I like least about Qbserve the fact that there is no Qbserve for iOS! What else can I put here when an app does exactly what you want it to do / what it says it can do?! Overall: I love the quantified self stuff, so just keeping an eye on how long I'm doing what, especially wasting time when I have things I need to get done, is interesting to me and useful in the sense that I can set some goals for myself in terms of eliminating procrastination. Pros: It is private, easy to use and unobtrusive. The developers are very responsive in bringing new features, and addressing bug reports . 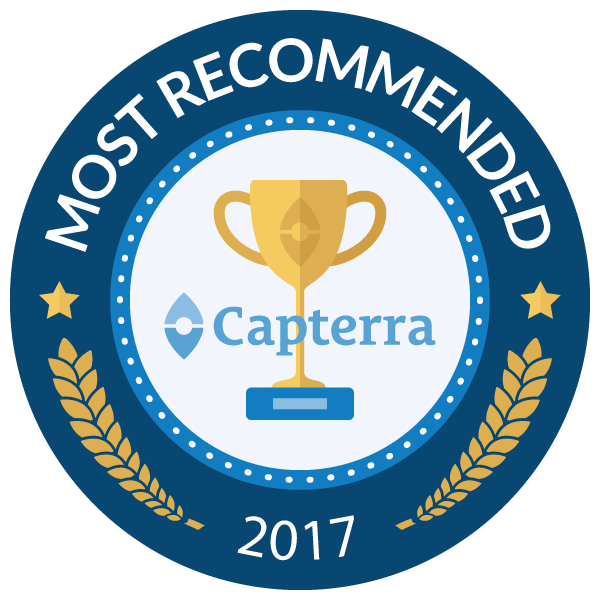 It was the perfect tool to help me keep track of my daily browsing habits and finding other productivity killers. Overall: I have gained insight on my daily productivity. I have nipped productivity killing habits. I am better able to keep myself accountable for the amount of work I am producing. Excellent I've been a user for 5 months, and Qbserve has become an important part of my workflow. Pros: It's incredibly quick to set up and very easy to use. Since it runs in the background, Qbserve doesn't require very much from me as a user but whenever I need it, it's fast and responsive, providing detailed statistics and activity metrics. In particular, the Time Sheet tab is invaluable, presenting a wealth of data that's easy to navigate and helpful when it comes to finding specific information. The 'live' dock and menu bar icons are also pretty nifty, and handy for letting me know when it's time to kick my brain into gear after too much procrastination. Cons: The categorisation of activities can be a little clunky, and it's not always accurate at detecting whether an activity should be marked as productive or not. In any case, the software allows the user to rectify this, so it's a minor complaint. 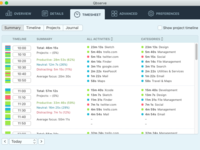 Overall: Increased productivity and a handy way to keep track of my software and online activity! Pros: Qbserve provides me with an easy way to track my activities while on my computer. This has kept me honest with myself about how much time I actually spend working, versus playing around on the internet. Cons: I wish that it provided a more granular amount of information into what process I was running within iterm2 so that I could disambiguate irssi from vim. Additionally, a per-git-repo breakdown would be incredibly helpful. Overall: More granular insight into my computer habits. The best partner to improve your productivity ever! Pros: The Qbserve app is a good way to track your habits and to show the hard reallity of how you have been spending your time in front of computer. In my opinion Qbserve is the best activity tracker because it's fully automatic, private and intuitive! Cons: So, could have some feature to customize the reports by projects. Because, sometimes I need to know how much time I spent with on a specific project. Overall: My productivity has been increasing every day with Qbserve. - Detects & separates different activities even inside a single app, for example, chats inside your messenger app or websites in your browser. - Nothing to add, really, it is really that good. Overall: - Automated & unobtrusive way to keep track of my daily activities. This is a great app - it's simple and focused. It helps me get more out of myself everyday. Pros: I like the UI of the app. Most of the time it's just a simple percentage in my menu bar that tells me how productive / distracted I've been that day. So simple, and very motivating. Overall: Get more out of my time everyday. Qbserve made me more conscious about the time I spend in front of the computer! Pros: Very clean interface, easy to understand at a glance. The category system is well done and easy to update. The best time tracking app I could find, great customer support. Pros: Great that there was a one off payment not a subscription like a lot of other time trackers. Really nice UI too, nice use of graphics where other apps are very spreadsheet like. It gets the basic job of time tracking done completely hands off, but you can add more complexity if you want too. Cons: The only thing missing for me was a way to log idle time, e.g when you are away from your computer in a meeting. Hopefully this will come in an update. 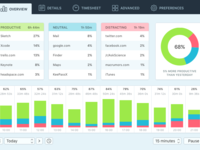 Pros: It tracks my NET work time, and puts everything away that is distracting. In the end of the day I know exactly how much I worked and how much I f*d around. 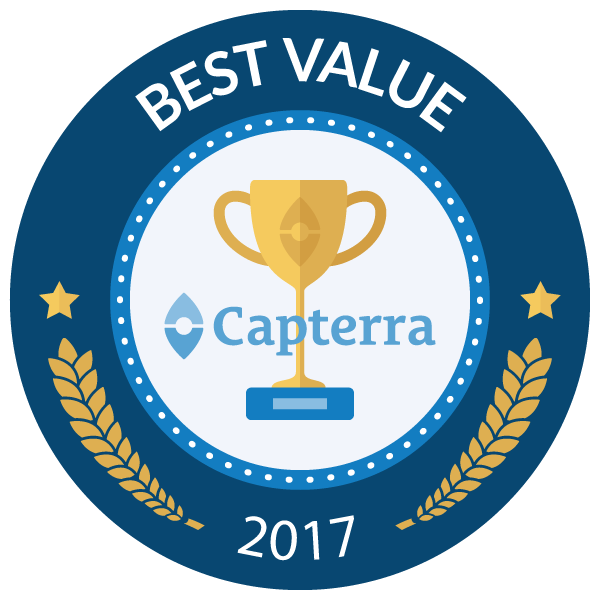 Cons: I was hesitant about the price, but after seeing how little that program interfered my work, and how much insights I get - it's worth 10x its price. Overall: I work more focused. Excellent app for discovering how you spend your time. 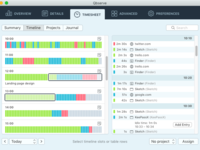 Pros: The best UI of any time tracking software I've used. It's extremely simple to get setup, but also has some more complex features available to use. It's also continually under development, so features are being added and improved. Cons: The timesheet is a newer feature and there are improvements that could be made. The projects and containers are good, but aren't the easiest to setup. 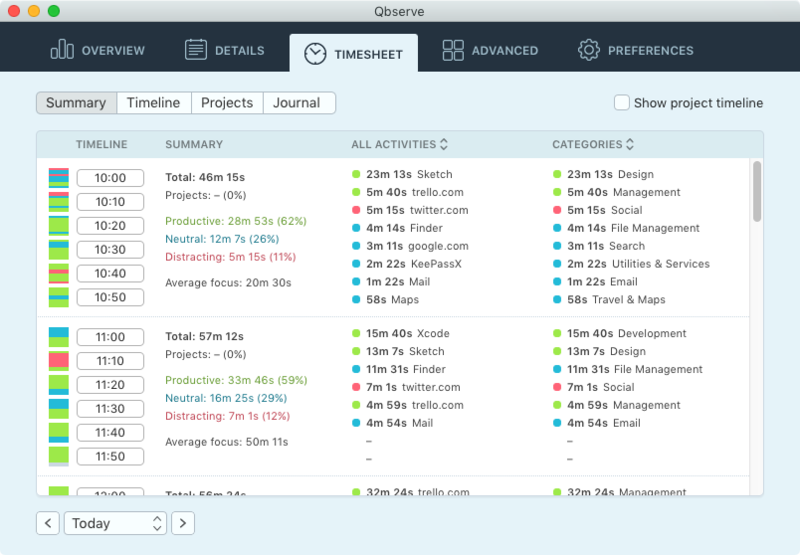 Overall: Qbserve helped me understand when I work, how I work, as well as when I'm wasting my time being unproductive!